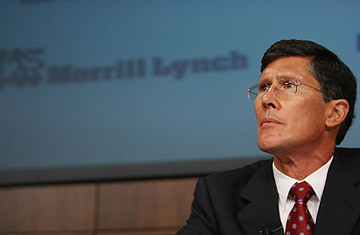 John Thain's swift departure as head of Bank of America's (BofA) Merrill Lynch unit after a 15-minute dustup with his boss, CEO Ken Lewis, is a consequence of friction that occurs when conflicting business maxims come into contact. And the fact that Thain must really love to ski. Thain played by that rule even though he was relatively new to Merrill, having arrived 14 months ago from the New York Stock Exchange. But he infuriated Lewis by paying out a couple of billion bucks in bonuses before the deal had closed and before disclosing to Lewis that Merrill was going to produce $15 billion in losses for the quarter. Hey, he was just taking care of his people. What's the problem? Then there's Vail. Having known about the big upcoming losses, Thain nevertheless went ahead with a previously planned vacation to the Colorado ski resort, where he has a place. You really can't blame the guy  conditions were awesome! Vail and the rest of Colorado got absolutely hammered with snow in December. And if you've ever been in the back bowls at Vail in a foot of fresh powder, you can understand Thain's thinking: Let's see, I can ski in perfect conditions in one of the most beautiful places in America or I can stay in New York City and face all the nastiness that's going to happen whether I'm there or not. Thain got on the plane. Of course, there's always a chance that what is going on here is very different than it appears. Perhaps things weren't that bad when Thain decided to take off to Vail, and then Lewis got ahold of Merrill's books and decided to make them look worse than they actually were. Too dastardly, you say? Maybe, but Lewis could use the illusion of a bigger loss to get money from the government and at the same time get rid of Thain. What's more, if Lewis hangs on, the latest loss makes 2009 earnings look better than they otherwise would. The only problem with this theory is that it's very risky for Lewis, because the big loss at Merrill makes him look bad too and puts him at risk as well. Our advice to Ken: Don't go skiing.